According to the official statistics, Anzere ski resort is the sunniest spot in Switzerland - purpose built resort with the traditional Swiss architectural style. It is very popular, car-free, open space and safe for children resort for their winter ski holidays for the whole family. That combined with the overlook on the Rhone Valley will take your breath - it is a true masterpiece. Alps2Alps provides first-class ski transfer to Anzere, therefore you can count on your vacation starting on a high note in this Swiss mountain paradise. The ski resort was built in 1965 and it is located in the Valais region of Switzerland. Its construction was based on well-studied planning and designed layout. Valais benefits from its sunny location and one of the lowest precipitation levels in the whole country. 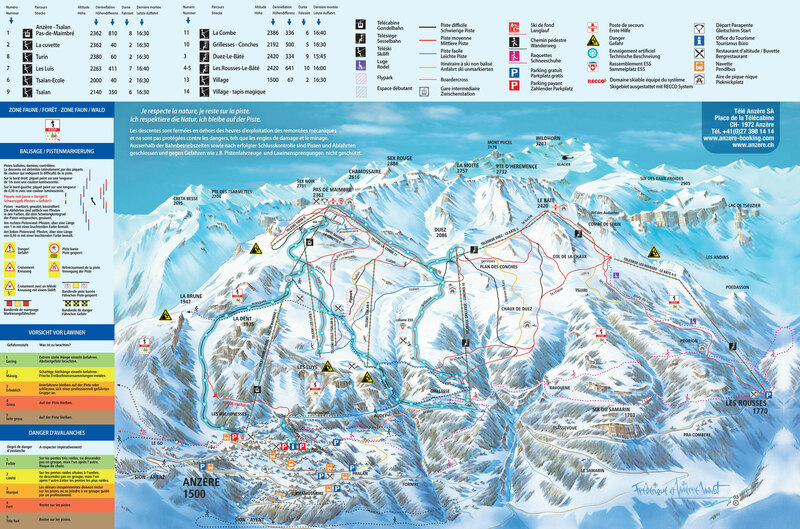 It is a rather large resort and is best suited for intermediate skiers and snowboarders, but everyone can find a course that fits him perfectly. In the Anzere resort, you will have a chance to see Alpine huts built of stone and wood, there is even a spa at the resort for regenerating after a long day of skiing. There are no direct trains to the Anzere ski resort. The closest train station is Sion, from there you can take the transfer bus to Anzere that operates daily. All of the above will only result in our base-rate for ski transfers going down. We have substantial discounts for midweek (Monday-Friday) transfers (prices will be up to 60% lower than weekend prices) and you can save even more if travelling during the off-peak and off-season. When calculating the final price for your transfer to Anzere the vehicle utilization and availability, schedule of transfers and other costs like road tolls and parking fees are all taken into account. To discuss any specific requirements or plans to travel as part of a larger group, get in touch with us directly. The Anzere ski resort offers both - challenging mogul runs to combine technique and pleasure as well as high-speed pistes for every taste. There is also very well built snow park for snowboarders and halfpipe. Anzere is made with families in mind - the ski resort offers ski lift pass discounts for children, youth, seniors and families too. In the centre of Anzere, there is a special ski lift and a magic carpet for children and beginners. The local ‘’Swiss Ski and Snowboard school’’ is highly rated in the region, therefore you can count on enthusiastic instructors and plenty of new skills that every member of your family can learn. To get the best possible deal for your transfer to Anzere, book your transfer as soon as possible. If you can’t find the services you have been looking for, get in touch with Alps2Alps and we will do everything to help to make your transfer at a high level. Wherever you choose to go, Alps2Alps will be ready to help!